Safely Dry Your Vehicle in Seconds! The Clerét Auto Chamee removes water from freshly washed vehicles in seconds saving time and towels. It features super flexible dual wiping blades which conform to body contours. 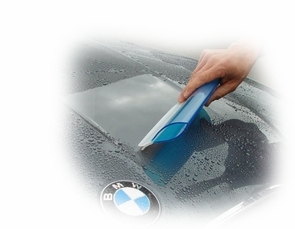 The blades are made from special blended PVC which will not damage your vehicles finish. The Auto Chamee Pro comes with dual 10" blades .It swipes away huge volumes of water with just one swipe. So What Makes The Auto Chamee So Special?